I am in the process of analysing my research for my thesis. My thesis is on the impact my questioning had on student learning of fractions. I was quite surprised at the amount of questions I asked and the types of questions I asked. The chart is split into two different groups Questions (in black) and Talk moves (in red). I tallied all of them together and in a three week unit I ask or did a total of 588 talk moves/questions. This first of all surprised my that I ask or did so much. Most of the time we often think of teaching as just standing there and lecturing, not getting the student involved. however, that wasn’t the most surprising stat. What really got me going was that even though I may have done more talk moves then asked questions the majority of these actions were related to a big idea. I wasn’t just trying to get the kids to talk about the subject, I wanted them to articulate a big idea of point in mathematics. So I ask you to think about your practise. What types of questions are you asking? What are you doing to make your students talk? What is the majority of your time in a unit spent on? Just some things to reflect on. Give kids an inch and they go the mile! Inspiration is the inch! For this challenge, they are to do a presentation about something they have researched, made, drew, or created about the medieval times. It allows the students to go off and explore topics that are not covered due to time. The kids absolutely love it. When given the chance to learn and when that learning is appreciated kids excel and go above and beyond. Yes there may be parent help but shouldn’t that be encouraged sometimes. All I know is that when given the chance to excel and show their learning, in an environment that students feel appreciated and engaged, they will rise to the occasion no matter the type of student we have. 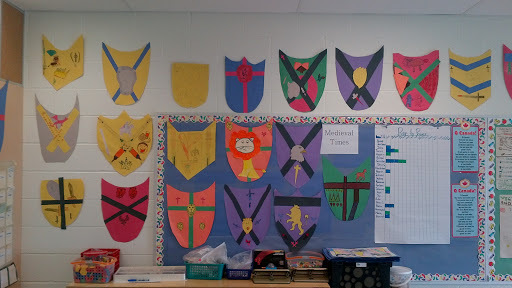 This is a medical shield project inspired by a students idea on coarse of arms. 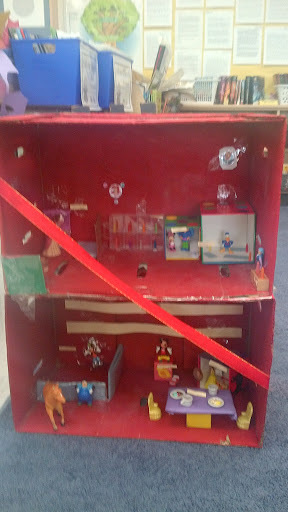 Students loved it so much they did a whole class project. This I is a manor house. Not all correct in the representation but learning non-the-less. Author MrSoClassroomPosted on May 21, 2013 May 7, 2016 Categories motivation, Student engagementLeave a comment on Give kids an inch and they go the mile! Inspiration is the inch! Inquiry doesn’t promote fact growth, or does it? I was out with a friend of mine last night when we got into a heated debate about inquiry based learning. I was fine with his opinion until he got to the part that inquiry learning does not promote facts. His argument was that teachers spend too much time letting the kids explore that they forget about the actual computation that is needed for them to do the math. My argument, was that though I can’t speak for ever teacher who teaches inquiry, only myself and those that I have seen, it does. Not to be frank with my argument but it does. As a teacher it is my job to make sure that my kids are learning mathematics. This means that they aren’t just figuring out amazing ways of solving the problem but are actually talking about the mathematics. Facts are amazing but without a context they are just facts, meaningless and useless facts. In an inquiry based learning environment students do learn their facts, maybe not as quickly as if I used flash cards and mad minutes but they don’t forget them once they have learned them. In addition, my students also learn them in engaging ways, through games and contextual problems. But this is only my opinion, would love to hear what you all think? Author MrSoClassroomPosted on May 20, 2013 Categories http://schemas.google.com/blogger/2008/kind#post, Mathematics, Problem based learningLeave a comment on Inquiry doesn’t promote fact growth, or does it?